A rare 19th-century image by pioneering British photographer Roger Fenton has been saved for the nation thanks to a fundraising campaign. Earlier this year the 1858 photo was barred from export by the UK government in the hope that a buyer would come forward to buy it. The Art Fund and National Media Museum (NMM) have since joined forces to raise the £108,506 needed. The Art Fund provided £49,000 of the cash required, while the NMM provided the rest. The photo, called Pasha and Bayadère, was part of a series of 50 Orientalist photos inspired by Fenton’s expedition to the Crimea. 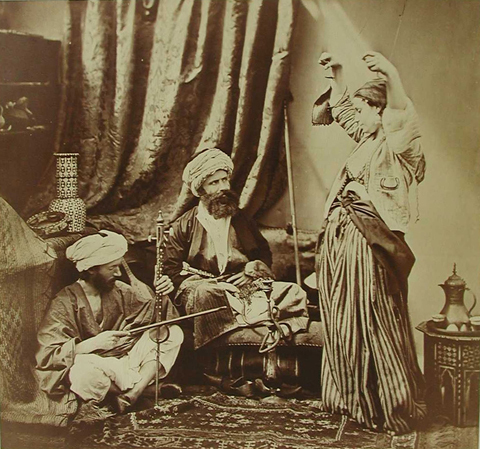 It was staged in a London studio and shows the photographer (pictured centre) dressed as a Turkish military or civil official (Pasha), watching a dancing girl (Bayadère) perform. It is one of only two examples of this image, the other being in the J Paul Getty Museum in Los Angeles. However, Getty’s version is uncropped and believed to be a proof, making this version (pictured) cropped for exhibition ‘unique’, said former Culture Minister Margaret Hodge earlier this year. Best known for his images of the Crimean War, Fenton is credited as one of the first war photographers, and renowned for mastering every genre he attempted to capture. Paul Goodman, head of Collections at the NMM – where the photo will be housed – described the rescued work as ‘hugely significant’. Lord Inglewood, chair of the Reviewing Committee which had barred the picture from export in February, said: ‘Photography is sometimes undervalued in this country, but Pasha and Bayadère demonstrates how the best photographs can hold their own aesthetically against other art forms.